This information was sent to “The Tab” from one of our faithful and loyal, longtime members Deacon Bruce Turner. The Deadline comes before our 3rd Sunday publication and so we wanted to share this information here, at MyTabNow Online – For anyone who can benefit (but especially anyone who is part of our Tabernacle Family) from this special Steve Harvey Scholarship – Here is the information. 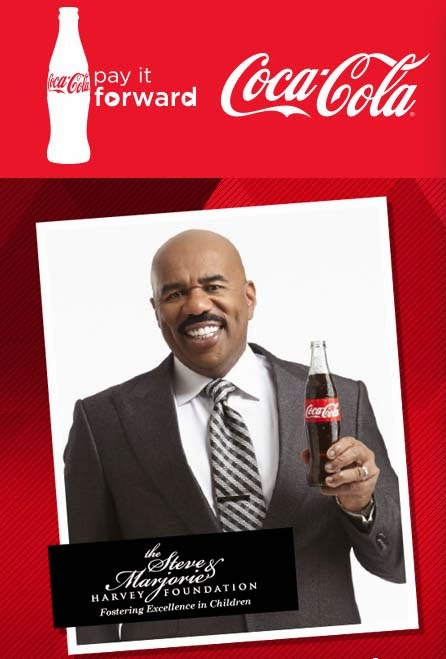 Nationwide (BlackNews.com) — Comedian/ TV personality Steve Harvey and his wife, via their Steve and Marjorie Harvey Foundation, have partnered with Coca-Cola to create the Coca-Cola “Pay It Forward” Scholarship Program. Students can compete for the opportunity to win an apprenticeship experience with Steve Harvey, and a $5,000 educational scholarship. Runner-up winners will receive a $1,000 gift card. The apprenticeship will include the opportunity to participate in the Steve Harvey Mentoring Program, including working with members of his team and learning what it takes to run the Steve Harvey Morning Show and Family Feud. They also will have the opportunity to meet and be mentored by Steve Harvey himself. To apply, applicants can either nominate themselves or someone else. They have to complete a short application, and write an essay submission. The essay must not exceed 100 words in length (each question is limited to 50 words); and must be 100% true and original. In addition, all applicants must be between the ages of 16 and 21. The program is just one of many offered by The Steve and Marjorie Harvey Foundation, which provides outreach to fatherless children and young adults, by promoting educational enrichment, one-on-one mentoring and global service initiatives that will cultivate the next generation of responsible leaders. Thank you for sending this information to us Deacon Turner, and we do hope this helps someone in need. Also each year we provide assistance to members of our church through our Edna G. White Scholarship Fund. More information will be posted here soon. You can also check our website @ http://tabernacleoffaithbaptistchurch for the application once it becomes Available for 2014. You’ll want to put our Annual Edna G. White Scholarship Service & Luncheon on your calendar. Look for it around the Summertime. The Edna G. White Scholarship (named after our dear belated Sister Edna G. White) has helped many of our members and former members, continue their education. You’re invited to learn more about this Scholarship Fund – please visit our historic Baptist church, the next time you’re in Los Angeles, California. Posted in Events, Services and tagged deacon bruce turner, Edna G. White, los angeles, Scholarship Fund, scholarships online, steve harvey scholarship, tabernacle of faith baptist church by Media Ministry Admin with no comments yet.